Meaning: Seven purified souls of Fakirs, annihilated in Allah, immortal with Allah, absorbed in the contemplation of the Essence, all core without any flesh or body, drowned in the unfathomed ocean of Divine beauty appeared on the eternal tree of pure transparent belief seventy thousand years before the birth of Adam. They are not Allah neither they are separate from Allah. Faqr is exactly Divine Essence. The Universal Divine Man is perfect and accomplished in Faqr, therefore he is the manifestation of Divine Essence and all His attributes. Since authority over the universe is among one of the attributes of Allah. Hence the Universal Divine Man possesses the authority over everything in the universe. Sultan-ul-Ashiqeen Sultan Mohammad Najib-ur-Rehman is the Universal Divine Man of the present era. With his great spiritual powers, Sultan-ul-Ashiqeen has shown such esoteric and spiritual marvels on the path of Faqr that are beyond an imagination of a common man. Due to these marvels, teachings of Faqr progressed in his time that is rarely seen in the past. Below we will present few of his marvels, since elaborating them all will be like performing an impossible task. To elucidate these marvels through living examples, we took observations of his disciples. 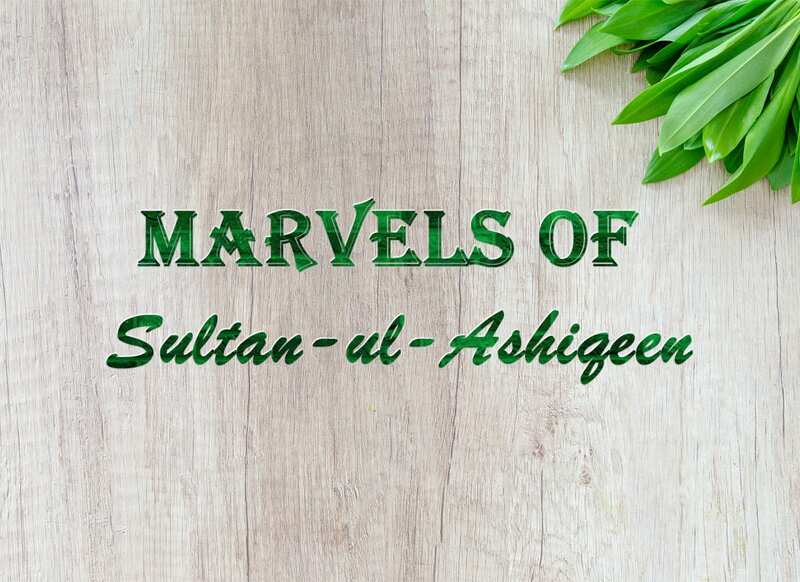 These observations are extracted from Sultan-ul-Ashiqeen, a book written on the sacred life of Sultan-ul-Ashiqeen. It is a great marvel of Sultan-ul-Ashiqeen that many seekers of world became seekers of Allah. A disciple Hammad-ur-Rehman describes that he was involved in the love of world and used to keep a company of bad people. He had learnt Quran by heart, but the inward had not enlightened with it. But after he pledged the oath of allegiance on the sacred hands of Sultan-ul-Ashiqeen, teachings of Quran started to illuminate his inward. Evil and worldly love vanished, and he became a seeker of Allah. Sultan-ul-Ashiqeen has sanctified the inwards of innumerable disciples from the desires of both worlds with just a glance and through granting the invocation of Ism-e-Allah Zaat. He made them truly the seekers of Allah. A seeker who adopts persistence in Faqr, Sultan-ul-Ashiqeen purifies his inward from all spiritual diseases. The Divine light manifesting from the sacred self of Sultan-ul-Ashiqeen purifies the soul of seeker due to which he becomes capable for the presence in Divine court. The conversation of Sultan-ul-Ashiqeen is brief yet so comprehensive and effective that it leaves an influential mark on the inwards. His speech changes the spiritual conditions and outside circumstances of his disciples. The miraculous words of Sultan-ul-Ashiqeen make everyone in the gathering feel that he gained answers to his questions and solution to his problems. At the end of Sunday gatherings everyone seems happy and contented that the enlightened conversation of Sulatan-ul-Ashiqeen contained solution to all their problems. Knowledge of inspiration is not acquired from books. In fact, it is conferred upon the esoteric self. It is one of the marvels of Sultan-ul-Ashiqeen that he bestowed many true seekers with a knowledge which they were completely unaware of. For instance, Ahsan Ali Sarwari Qadri, one of the disciples of Sultan-ul-Ashiqeen was unacquainted with Arabic and Persian languages. Yet with the benificience of Sultan-ul-Ashiqeen, he translated an Arabic book of Shaikh Abdul Qadir Jilani Sirr al-Asrar in Urdu. He also did an urdu translation of the Persian book of Sultan Bahoo Ameer-ul-Kaunain. Currently he is translating many other Persian books into Urdu. Similarly, Mrs Ambreen Moghees who studied subjects like math and statistic all her life but owing to the inspirational knowledge conferred upon her by her spiritual guide Sultan-ul-Ashiqeen, she translated Persian books of Sultan Bahoo into English. She also did an exegesis of an eminent book of Sultan Bahoo, Risala Roohi Sharif which is quite difficult to understand for a common person. Likewise, many disciples like Nasir Hameed, Mohammad Sajid, Mohsin Saeed, Mirza Suleman were unacquainted with the art of poetry when they first begin to express love for their spiritual guide through poetry. Now with the beneficence of inspirational knowledge granted to them by Sultan-ul-Ashiqeen they write an exalted level of poetry. Many disciples of Sultan-ul-Ashiqeen obtained salvation from evil spirits due to his beneficence. He is a Universal Divine Man and holds authority to exterminate the effects of evil spirits that occur as a result of black magic. Nasir Hameed suffered from demonic influence since childhood. Even magic healers were unable to treat the effects which kept him in huge suffering. But after pledging oath of allegiance he got salvation from these effects due to the beneficence of Sultan-ul-Ashiqeen. Moreover, Yasmeen Sarwari Qadri had a mysterious environment in her house due to the influence of black magic. Often, she used to hear sounds of dishes rattling, or would see a lit bulb suspending in the air that would disappear after a while. But after becoming a disciple of perfect spiritual guide Sultan-ul-Ashiqeen she attained salvation from this torment. Just as Sultan-ul-Ashiqeen liberate his disciples from inward diseases with his Divine attention, his seekers also gain deliverance from physical diseases. Many disciples witnessed relief from their physical diseases after pledging the oath. For instance, Mohammad Abdullah Iqbal suffered from blood pressure and had to take medicine everyday but after pledging oath it went away itself after a while. Mrs. Ambreen Moghees endured sore throat. Doctors suspected it to be a throat cancer. But she found herself recovering from it soon after she became a disciple and never even had to take medicine again. Another disciple Faiza Saeed describes she had a strange disease called Sarcoidosis. This very rare disease causes each organ of the body to slowly becomes handicapped. The treatment of this disease is still undiscovered. But it went away with the immense favour of her spiritual guide after she pledged oath which even amazed doctors. A perfect spiritual guide keeps an authority even over realm of souls. Numerous seekers of Sultan-ul-Ashiqeen observed this marvel of their spiritual guide. Here we relate an instance of an elderly disciple of Sultan-ul-Ashiqeen Mohammad Ameen Sarwari Qadri who passed away on May 19th, 2015. He was a resident of Uuch Sharif, Pakistan. Sultan-ul-Ashiqeen sent Mohammad Asad Sarwari Qadri and Mohammad Faruq Zia Sarwari Qadri to attend his burial services in Uuch Sharif. After Qul ceremony they visited the grave to make prayer of intercession. There Mohammad Asad through the power of kashf-ul-quboor (unveiling of the states of graves) bestowed to him by his spiritual guide saw the internal state of the grave which was like a wide green garden. The dweller of the grave told Asad that it was the beneficence of his spiritual guide. From there they went to the shrine of Sayyid Mohammad Abdullah Shah Madni Jilani. Through dawat (knowledge of communication with the sacred souls of shrines), Abdullah Shad Jilani told them that their spiritual guide assigned Mohammad Ameen to train the dwellers of the realm of souls. The souls who could not gain the beneficence of spiritual guide during their life time or whose inward journey remained incomplete. Hence the beneficence of Sultan-ul-Ashiqeen continues even in the realm of souls. Sabeen was another disciple who passed away just few months after pledging oath of allegiance. After her death Ambreen Moghees and Faiza Saeed (both are disciples of Sultan-ul-Ashiqeen) met her soul spiritually and saw that she was worried about her kids. But after a while when both sisters met her through the power of kashf-ul-quboor, they found her contented due to the beneficence of Sultan-ul-Ashiqeen. She told them that her spiritual guide handed her over to Fatimah tuz-Zahra and her training was continued in the realm of souls. Here it is worth mentioning that Ambreen Moghees performed meditation in Pakistan while Faiza Saeed performed it in Switzerland at different times and they both saw the similar state of Sabeen spiritually. Disciples of Sultan-ul-Ashiqeen reside in different countries throughout the world besides Pakistan. The perfect spiritual guide Sultan-ul-Ashiqeen is as informed of his disciples residing overseas as he is of the seekers living close to him. Ali Raza who was living in England, describes that he used to remain worried about his circumstances. One day while working out in gym, he felt the presence of his spiritual guide in front of him. Sultan-ul-Ashiqeen advised him to stay happy. Ali Raza says that his worries disappeared, and he found himself in peace later. Similarly, Faiza Saeed tells that when her husband bought a restaurant in Switzerland, she developed an ultimate desire for her spiritual guide to visit her restaurant. The desire kept getting immense every day. Few month later they felt some employees were manipulating their accounts, however they were unable to trace them. One day she went to the restaurant holding the same desire. After a while she felt the presence of her spiritual guide who was sitting there and checking the accounts. She felt joyed and relieved. The scene disappeared after a while, but she profoundly felt his presence around her. Few day later they caught the fraudulent people and corrected the accounts. The inward of a seeker finds peace in the sacred company of Sultan-ul-Ashiqeen. If we read the book Sultan-ul-Ashiqeen, one observation is mutual among all the disciples. That is, the soul and body immediately find peace and calmness after coming under the oath of allegiance. One witnesses the same while enjoying his sacred company. Disciples who travel with him on preaching tours narrate that they never feel tired neither severity of whether bother them. This is all due to the company of Sultan-ul-Ashiqeen. “My mother was diagnosed with brain hemorrhage. Doctors declared a very little hope of her survival. I did not have money for her treatment. In a moment of desperation, I wept bitterly and asked for the favour of my spiritual guide. Just when I closed my eyes, I saw my spiritual guide Sultan-ul-Ashiqeen. He smiled and said: “Have no worry”. On opening eyes, I found myself at peace. After a while a friend of mine came to return me the money that I had lent him. Earlier he was not returning it despite of numerous demands. Mrs. Irum describes that she had three daughters and had a desire for a son. After oath of allegiance, the desire went away, and she became seeker of Allah. But a true spiritual guide always remains aware of all the desires. After some time, Allah blessed her with a son through the beneficence of Sultan-ul-Ashiqeen. In his books, Sultan Bahoo describes that a perfect and accomplished spiritual guide hold the ability to keep the evil away. Many disciples of Sultan-ul-Ashiqeen witnessed this ability of Sultan-ul-Ashiqeen. Mohammad Sajid Sarwari Qadri describes that he was going on a motorcycle with his family. He got into an accident and the motorcycle crashed badly but his girls remained safe even from a scratch despite of falling on the road. Likewise, Doctor Hamil Jamil also got into an accident where his ride smashed, but he and his family remained safe. Sultan-ul-Ashiqeen got the shrine reconstructed all over again and requested Abdullah Shad Jilani to resume his beneficence. He accepted the request with love and the shrine became a source of beneficence again. Today the dweller of the shrine Abdullah Shad Jilani fulfills the desires of the seekers of Allah due to his love for Sultan-ul-Ashiqeen. Faqr is spreading around the world in Sultan-ul-Ashiqeen’s era on such another level that one does not see in the past. His untiring efforts and extreme intellect have taken Faqr on such an elevated path of progression that it will be an example in an era to come. Sultan-ul-Ashiqeen took a revolutionary step to get the books of different shaikhs translated in Urdu and English so everyone could gain beneficence from them. He started a facility of online oath of allegiance (al-bayah) for the people living in foreign countries. In the past people used to travel hundreds of miles to pledge oath. But he made it easy for the foreign residents. Sultan-ul-Ashiqeen is using all means of multimedia design and development for easy access of the teachings of Faqr throughout the world. Wikipedia is the most recognized and consulted encyclopedia in the world. Many terms of Faqr and sufism were corrected on Wikipedia by his devotees on his order and under his supervision. Sultan-ul-Ashiqeen is using all means of social media (Facebook, twitter, Instagram, YouTube, daily motion, tumbler) to spread message of Faqr among vast majority of people. Sultan-ul-Ashiqeen wrote numerous books himself to convey teachings of He not only got these books published but also provided a facility to read them online. A disciple recited Sultan Bahoo’s poetry (kalam-e-Bahoo) on the order of Sultan-ul-Ashiqeen. The videos of this poetry are available at every social media of Tehreek Dawat-e-Faqr.